So I've been reading Henry Jenkins' book Convergence Culture, which talks a great deal about new forms of interaction with media. One chapter, Why Heather Can Write: Media Literacy and the Harry Potter Wars caused me a bit of trouble. This chapter practically evangelizes fan fiction as a legitimate form of writing, with the strong implication that it can and will lead to commercial writing contracts. I somewhat understand where Jenkins is going with this. It's exploring areas of a franchise which are otherwise left alone by the original author. Fan fiction allows the audience to participate, to deepen their connection to the works in question. Let's talk early web media. Back in 1997, a 10 minute short film called Troops effectively accomplished what Jenkins is discussing in this chapter. The film has Imperial Stormtroopers from Star Wars out on a domestic disturbance call at the Lars farm seen in A New Hope. To my knowledge, Troops really started the whole short films launched on the internet. While fan movies had been made in the past, they were not shared as extensively, and did not have the same capacity for collective enjoyment. Troops was embraced by the fan community, and was even recognized by Lucasfilm with the Pioneer Award at the 2002 Star Wars Fan Film Awards. Since directing the film, Kevin Rubio has been working as a freelance writer, and has even written an episode of the Star Wars: The Clone Wars animated TV series. Is film more receptive to fan participation? Perhaps George Lucas is more receptive to this type of collective intelligence? Lucas did have the foresight to maintain the merchandising rights to Star Wars, so this may be part of his goals for a larger media empire. There is an ever-growing Star Wars fans who own their own Stormtrooper costumes, such as the above photo which I took at the 2009 Ad-Astra science fiction convention. 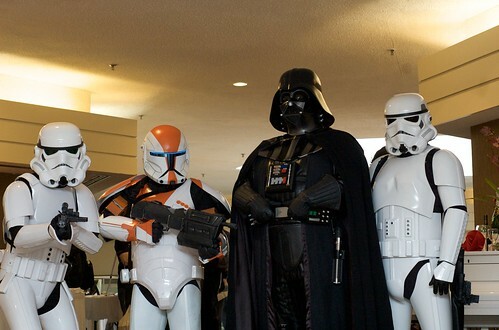 The 501st Legion epitomizes many of the convergence tactics that Jenkins discusses, and makes numerous appearances at fan conventions, as well as charitable events. From what I can gather, they have a relatively good relationship with Lucasfilm's Fan Relations department. How does this fit in with novel and short story writing? Copyright law is in general fairly unambiguous, in that fan fiction firmly crosses that invisible line that marks out a publisher's rights. While some franchises, such as the Harry Potter universe have a thriving fan community, under the implicit approval of Rowling, most publishers and the authors they represent actively discourage fan fiction. The above link notes that Anne Rice, Anne McCaffrey and Raymond Feist have in the past asked fanfiction.net to remove derivative works. How then should fan fiction be judged? Is it a valid attempt at engaging with an author's world, or is it something which has the potential to damage audience perception of a work?